A day school was subsequently established in the parish, at 4 St Ann's Lane, with accommodation for 12 boys. A girls' school was added in 1790 for the reception of up to 13 girls. As the Society's funds improved, these numbers increased and in 1820, 30 boys and 32 girls were clothed and instructed. By 1783, the Society had established a country 'asylum' at Lavenham, in Suffolk, for the education and maintenance of 20 boys, with inmates being taken for the London school. In 1794, the asylum relocated to Peckham, where over 60 boys were housed. The rules for the school specified that children should be washed with care, morning and evening, and their feet washed once a week. Those who misbehaved were required to wear a notice detailing their offence and to apologise publicly for their misdemeanours. Visits from parents were restricted to the hours between four and six o'clock on Wednesday afternoons. Children could pay daytime visits to their parents four times a year. All visiting required the permission of the asylum's stewards. 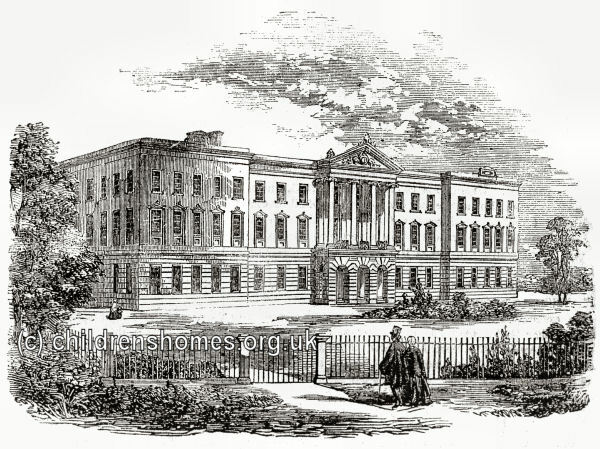 In 1829, the Society erected a large children's home at the east side of Streatham Hill in south London. The building was a handsome edifice of three stories, surmounted by a cornice and parapet, and fronted centrally by an Ionic portico and pediment, ornamented with the royal arms. Admission to the home was obtained either through nomination and election by subscribers, or by purchase. Not more than two children of the same parents could be either candidates or inmates at the same time. In 1890, admission by purchase cost £180 for children between the ages of 7 and 9, or £150 for those aged 9 to 12. Certificates were required of the parents' marriage, child's birth and baptism, vaccination and health, and a guarantees of removal in due course, or if required by the Committee. Children left the home on reaching the age of 15. No child was admitted who could not read, and, if over 9, write and do simple arithmetic. By 1881, the existing building had become too small and the Society erected new Schools on a site at Redstone Hill, Redhill. Opened in 1884, at a cost of about £60,000, accommodation was now provided for 400 boys and girls. The imposing building, with its turret clock, was in an elevated situation, about 300 feet above sea level, and commanded fine views of the surrounding countryside. The Redhill site is shown on the 1913 map below. St Anne's Society site, Redhill, c.1913. The buildings were constructed in brick and slate. The main block, which comprised lower ground, ground and three upper floors, was approached from Station Road along a wide drive terminating in wide sweep in front the principal entrance. To the east of the main building, reached by covered walkways, there was a complete steam laundry, swimming bath, with boiler beneath for heating purposes, and large gymnasium. The lower ground floor contained a suite of sanitary and other offices and rooms, together with bakery, and covered playgrounds. On the ground floor were are large and lofty dining hall, capable of seating over 600, class rooms, officers' rooms, assembly rooms, etc., and a tiled corridor. On the first floor was dormitory accommodation for 180, bedrooms for the staff, Board room, medical room, etc. The second floor contained further dormitory accommodation for 180 and other bedrooms, together with the building's hot-water tanks. The third floor contained staff accommodation. To the north of the main building were an infirmary, isolation hospital and headmaster's residence. At the south was a fine chapel with seating accommodation for about 600, together with gardeners' lodges and out-buildings. There were both asphalted and grass tennis courts, an enclosed recreation ground, extensive kitchen gardens and orchards, the whole estate containing about 17½ acres. Due to financial problems and falling admissions, the Schools were closed in 1919. The following year, the site was put up for sale at a price of £30,000. No purchaser could be found although the Schools' contents, which included iron bedsteads, 1,500 blankets and 21 pianos, were sold. In 1926, the Foundling Hospital, which was moving out of its London premises, asked to lease the property as a stop-gap until it erected its own new buildings. The Governors' of the St Anne's charity, desperate to sell the site, refused such an arrangement and the Foundling Hospital eventually bought it for the reduced price of £25,000. After the Foundling Hospital vacated the site in 1935, it was acquired by Surrey County Council as a geriatric hospital known as St Anne's Home for the Aged. In 1973, the premises were converted for use as accommodation for the homeless but closed in 1975 after being severely damaged by fire. The building was demolished in 1987 and is now covered by modern housing. The former St Anne's site at Streatham Hill was subsequently used as a workhouse by St Pancras. The building no longer exists and the site is now occupied by the Pullman Court flats. Since the 1920s, the Society's assets have been used to award grants to 'provide clothing, maintenance and education for children of parents who have seen better days'. Many of those assisted are the children from clergy missionary and army families. By the 1980s, it was estimated that around 250,000 children had been assisted by the Society since its founding. The Society is now based at King Edward's School, Witley, Godalming.